otoGo is the all-in-one batch photo processing and conversion program that enables you to batch convert, resize, rename, add effects, watermark, fix and enhance photos at one go. FotoGo can processing on over 100 different image formats and convert them to 56 formats, including popular formats such as: JPG, PNG, TIFF, PDF, GIF, TGA, PSD, EPS, and BMP. as well as RAW image formats generated by almost all DSLR digital cameras (including: Canon, Nikon, Olympus, Casio, Fuji, Kodak, Pentax, Panasonic, Sony and etc.). Users can easily resize photos based on predefined profiles or your custom size, and also rotate images. Add a text and image watermarks to protect your pictures from being stolen. Optimize photos by adjusting brightness, exposure, sharpness, temperature and contrast. Fix digital photos by Remove red-eye, Remove noise, and can even correct small focus problems with Sharpen filter. Special effects can also be applied to photos, effects such as: black & white, Oil Paint, Sepia, Charcoal, 3D, and Negate. Give meaningful names to your images instead of the default cryptic names. Get your photos ready to be printed or uploaded to websites! this Mac photo processing software offers a lot of batch-editing options that will make working with multiple images/photos easier and quicker than ever. Works on Mac 10.6 or later. MAC OS X v10.6.8 and higher operating system; 512 MB physical RAM (memory) or more. 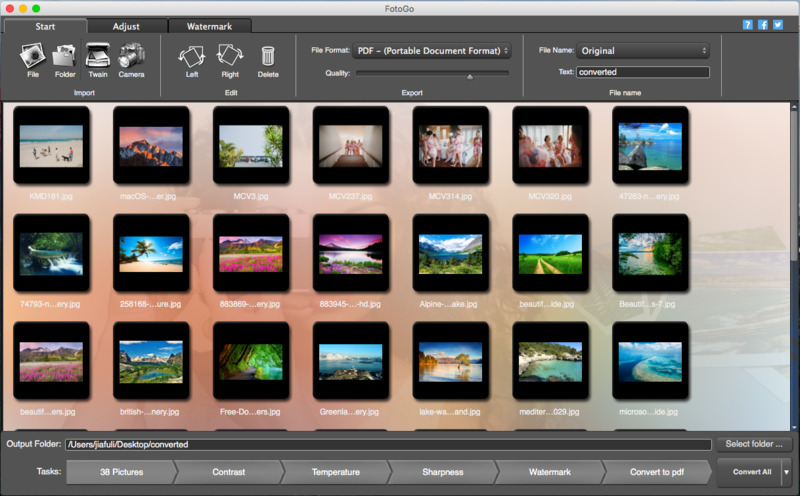 Compatible With Mac OS X 10.12; Supports newer cameras and more RAW formats; improved output quality for all formats. Mac Photo Converter Image Converter batch converter photo editor photo processing photo editing software photo watermark convert photos RAW image conversion Batch rename images Rename Photo resize images Remove noise.